Angela has been working so much that there has not been time for the blog! Oh no! Guillaume passed his 75% test at work. He learned a lot about cheese, wine, and the restaurant where he works (the building, the chef, the food). Angela helped him to study, so she knows a lot more than she ever wanted to about cheese. Today is Helen's birthday, so last night Andrew came up from Connecticut, and they all met at the Summer Shack in Cambridge. You may notice that you don't recognize the two people standing in front of the "fisherman". That's becaues Angela had to take this picture from the internet. She did not bring her camera to work that day, Guillaume didn't bring the camera with him when he met her in Cambridge, and Andrew brought his camera. He left it in the car, so he went back out to get the camera. When he came back in, he said the terrible words, "I left my memory card at the office." Oh no. So, we have no pictures of our Summer Shack visit, the food, Helen's birthday dinner. Nothing. Just our memories. Guillaume had some shrimp, oysters, and clams for a starter. Angela had some clam chowder. Andrew had "steamers" (steamed clams), and Helen had some fried smelt (a smelt is a little fish). For dinner, Guillaume and Andrew ordered the swordfish, and Angela and Helen ordered the flounder, stuffed with crab and shrimp. Helen didn't like hers, so Guillaume traded with her, and really enjoyed the flounder. There was too much, so Guillaume will have lunch today! Angela is off to treatment soon, and Guillaume, Andrew and Helen will meet her at the hospital later, to give Helen her birthday present. In case Helen is reading this now, we won't say what the present is... But later for sure! Speaking of presents, last week, Angela's friend, Marie Elena, who works at the hospital gave her a present for finishing her radiation treatment. 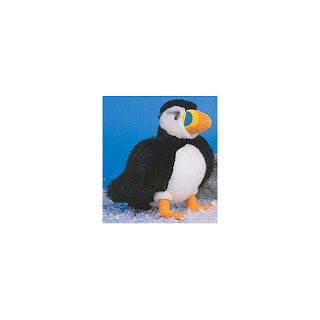 A puffin. So now Angela finally has her puffin at home. Guillaume bought a very warm winter coat yesterday. He looks like a big brown marshmallow! And he's very warm. All he needs now are snow boots, and he will be ready for the Boston winters. Their Christmas tree is still alive and beautiful, and presents are starting to go under the tree. But still more shopping has to be done. A tout a l'heure, tout le monde! Gros bisous! Happy Birthday Helen , all the best for you and your family ! On the six december it is also the "saint Nicolas" ! WORK..WORK..and WORK..it's a song I know very well..
Each day, it's for my Insurance Company and tomorrow (saturday), it's for a friend; he sells sets made in silk for table and I help him before Christmas...it's really pleasant even we are standing all the day long..